The four of us in bed. We were scared to death. We had NEVER succeeded in putting Eva inside her crib. It was as if she were allergic. We were running out of time because due trips, laziness (“I’m too tired tonight, tomorrow we have to wake up early…”) and family celebrations, we had postponed it and I was already six-and-something months pregnant. 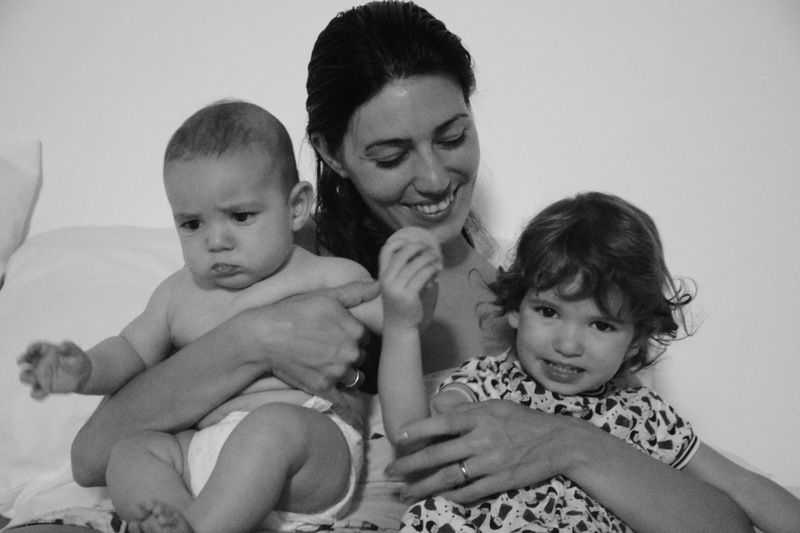 Besides all that, Eva was acting a little weird during the last months of Samuel’s pregnancy. She suspected imminent changes, and couldn’t tell why I was getting so plump and had so little energy. We tried not to make it coincide with any other major changes such as potty training, her little brother’s birth or starting school. It’s best that these “big steps” take place one by one in order for the little ones to grasp them. Doing it all at once: not only take her out of our bed but also of the room. That way she could go to her own bed and I could lie down with her until she fell asleep (almost as if we were still cosleeping). Had we tried to do it gradually, putting her into a cot in our room, I don’t think we would have succeeded. 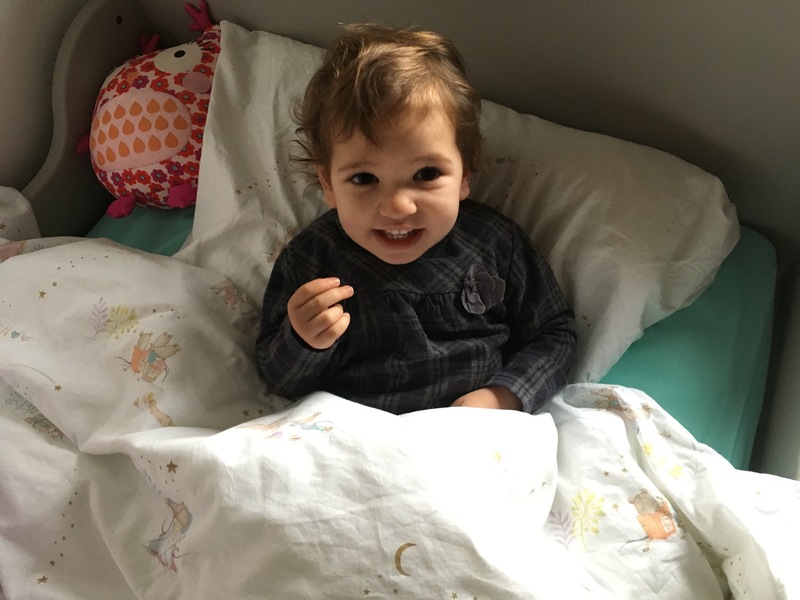 We wanted her to be able to have access to her own bed whenever she wanted so she could be more autonomous and didn’t feel caged (I learnt later that this is the method used by Montessori). At the beginning I insisted on a ground level bed such as the stackable ones or the cute little houses, but finally we decided on a low bed that can be extended as they grow and from which she can climb easily up and down. Playing in her bed with Grandma. Including her in the preparations: putting up the bed, the sheets, picking up the dolls that would sleep with her… kids love to feel involved and it’s a good way to get them used to their new surrounding. Setting out the most possible attractive environment: I hung up some lovely birds vinyl on the walls for her to see them during daytime and some illuminating stars between them for the night. We also bought a beautiful set of sheets. Newborn Samuel in Eva’s bed with the wonderful Ferm sheets. I spent the two first nights with her so she could familiarize with her own bed. There I stood with an inflatable mattress, seven months pregnant, looking like a beached whale, but it was effective. Creating a bedtime routine which we still maintain: both in bed, I read a story to her with a small lantern. Then we turn it off (although we always keep a small night light in case she wakes up), and I make up another story while she does “hand-breast”. Sleeping with Dani…or fooling around? Going to her quickly when she calls. Not leaving her to cry to get used to it: if she sees that the response is immediate, she won’t be overwhelmed. Call me exaggerated but I can’t stand to watch them suffer and I sincerely doubt that it helps them to harden and become self-sufficient, as many affirm. I believe that if a toddler (small little sparows) doesn’t get comfort from their main role models when they are afraid, far from becoming independent, their insecurities will increase. Leaving her door open as well as our room’s. That way, when she wakes up in the morning she can come to our bed. This makes her feel calm because she knows that staying in her bed is her decision, she can leave it whenever she wants. By now she can open the door herself but it still gives her confidence. The first two nights that I slept next to her, she didn’t wake once for the first time in her life. We passed the first test! Afterwards she wouldn’t go near our bed: she only wanted her big girl bed. Since then there have been ups and downs: when she’s sick I have to get up many times, and sometimes she sleeps through the night. Sometimes she calls for me and sometimes she comes to us instead. During trips she always looks for her own little bed, although she is delighted if we have to share a packed bed. We have won the lottery with this girl! With the kids in bed during a trip to Italy. My little mouse in her new bed. I hope that some of these tips have been useful for you. 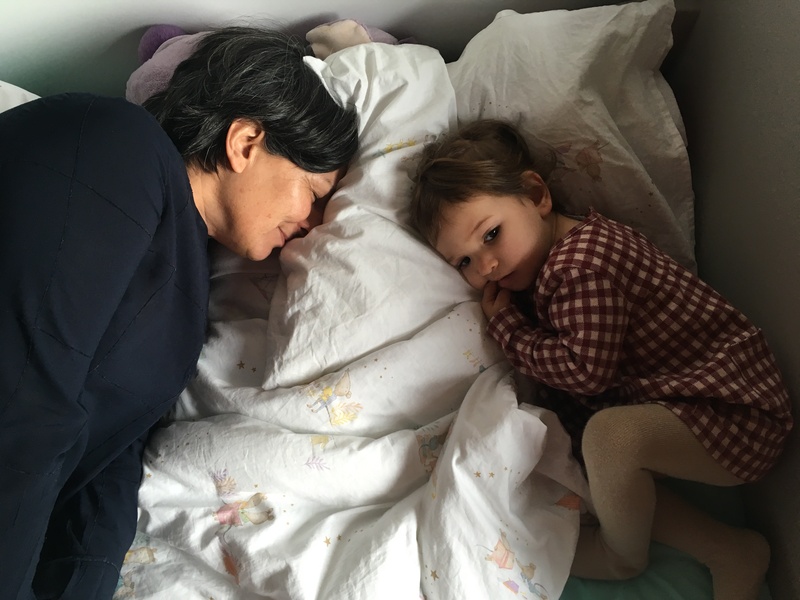 Leaving cosleeping behind is neither easy for them or for us! How was your own child’s transition to their bed? Did you use any similar tips?